Philip went down to the city of Samaria and proclaimed to them the Christ… So there was much joy in that city. Someone wise once told me, “Everyone divides the world into ‘good guys’ and ‘bad guys’. No one—not even the worst of humanity—ever reckons themselves one of the ‘bad guys’”. Who are your “bad guys”? Think of all the people you have known throughout your life. Is there someone who you consider to be your nemesis? Do you live in dread of certain people groups? What part of town do you prefer to avoid? For the Jews of Jesus’ time, there was a palpable prejudice against the Samaritans. The scattered preached. Persecution against the Jerusalem Church, led by Saul of Tarsus, caused a providential exodus of believers. Gospel seeds were being carried by the Spirit’s breath onto the fertile lands of Judea and Samaria. Persecution drove proclamation and Philip began preaching the Gospel of Christ to the Samaritans. The “city of Samaria” was the ancient capital of the northern kingdom of Israel and the animosity between them and the Jews in the south was deeply felt by all parties. About a thousand years before Jesus’ birth, ten of the twelve tribes separated themselves into an independent nation. For their sinful rebellion against God, Sargon of Assyria destroyed the northern kingdom and forced the tribes of Israel to intermarry with other people groups. As a result, the Jews of Jesus’ day considered the Samaritans to be racial and religious mongrels. Calling someone a “Samaritan” was an ethnic pejorative (John 8:48). For these reasons, it shocked the disciples that Jesus “had to pass through Samaria” to speak with the woman at the well (John 4:4) and may have further surprised them to discover that they must do even more than “pass-through” Samaria on their way to the “ends of the earth” (Matthew 28:18-20, Acts 1:8). The Samaritans paid attention. In a repetition of the Pentecost pattern, the Samaritans were in “one accord” (Acts 2:1). Why? The Holy Spirit was working among a hated, disenfranchised, foreign, unclean, and uncool people group to pave the way for the Good News. They paid attention to Philip’s preaching, but also saw many signs of God’s power among them. What they were receiving was not simply another religion, but the Gospel of Jesus Christ who came for all kinds of people without discrimination (John 1:7, 3:16, Acts 2:8-17). We must be careful here because the Samaritans were not yet repenting and believing in Christ alone, but that would soon come as the Spirit granted them the new birth. Millennia-old religious and cultural walls were collapsing, not because they fell, but because He pushed them. If “the gates of hell shall not stand” against Jesus’ Church, what chance do the powers of prejudice stand? The city partied. Jerusalem was becoming a city of suffering and sorrow, but Samaria had become a city of joy. Luke’s history of the Church is truly a tale of two cities in the best and worst of times. How a person or a people respond to the Gospel is telling. Impenitence responds with hateful anger, but faith responds with joy. For a thousand years, the Samaritans were told God had abandoned them, that they were not God’s kind of people. Through Philip’s Gospel proclamation, God touched the untouchable, they received the message that Messiah came for people just like them, and they were thrilled to hear the news! Do you respond to the Gospel with joy? Here’s a powerful principle: Our prejudices cannot survive His mission. Jesus said, “You will receive power…and you will be my witnesses…in Samaria” (Acts 1:8, emphasis mine). Those who received the Great Commission found that they had to “lay aside every weight and sin” of prejudice which slowed their progress. The Holy Spirit was the power of their witness and the power which overcame their prejudice. Will the same be said for us? In two millennia, will the Church remember us as people whose biased baggage was laid down at the foot of Christ’s cross for the sake of His mission? A teenaged girl was at odds with her family. After trying everything else, her parents asked her to talk to their pastor. Reluctantly and cynically, she agreed and went to see him one afternoon. When he asked about her troubles at home, she replied sharply, “I hate my mother!” What advice would you give? Should a course of counseling sessions be prescribed? Is there a process group for mother-hating daughters? Wisely, the pastor asked her to pray for her mother every day with specificity and detail for two weeks. When the girl came in for her follow-up appointment, her pastor asked how things were going with her mother. The words had barely cleared his throat when she began to sob. Her heart had softened and she was overcome with the love of Jesus for her mother. Perhaps the power to overcome our prejudices is closer than we know. And there arose on that day a great persecution against the church in Jerusalem, and they were all scattered throughout the regions of Judea and Samaria, except the apostles. Have you ever had a good bad time? Children teething, sad weddings, and joyful funerals all qualify as such oxymoronic events. Following the death of Stephen, the Church lived the words of Charles Dickens, “It was the best of times, it was the worst of times…it was the epoch of belief, it was the epoch of incredulity, it was the season of Light, it was the season of Darkness.” Through persecution, Jesus’ prophecy was fulfilled (Acts 1:8) as the story of the Church became a tale of two cities: Jerusalem and Samaria. Great pain was endured (Acts 8:2). Stephen, the Church’s first martyr, was beloved and his death sent shock waves through all Jerusalem. Notice the contrast which Luke makes for his readers between the two competing kingdoms with their opposing passions: Ungodly men had become enraged and stoned Steven, but godly “men buried Stephen and made great lamentation over him.” Stephen was filled with the Spirit (Acts 7:55), but the stiff-necked Sanhedrin resisted that same Spirit (Acts 7:51). However, even as their persecution began, God was prosecuting His plan perfectly. Great persecution was produced (Acts 8:1a). Religion without the Holy Spirit is the cruelest force in the world. The Sanhedrin raged against the Spirit and Saul ravaged the Church (Acts 8:3). Once again, it is important to see the contrasts drawn by Luke. While the Church appointed Spirit-filled, self-controlled, compassionate, and God-honoring men to care for widows and orphans, Saul of Tarsus was making widows and orphans. He not only attended and gave approval of (took joy in) Stephen’s stoning, he was also “ravaging the Church.” The word “ravaging” is a term used to describe the way a wild boar thrashes crops and violently slashes with its tusks anything or anyone in its way while foraging for food (Psalm 80:13). Like a ravenous wild boar, Saul went house to house dragging men and women off to prison and even killing some of them (Acts 9:1). Saints were scattered, but the Apostles stood their ground. Why? Great progress was made (Acts 8:1b). The same group of men who abandoned Jesus to the cross did not abandon their post in Jerusalem even under the threat of imprisonment and death. Perhaps we misunderstand Jesus’ command to be his witnesses in Jerusalem, Judea, Samaria, and all the earth as a progressive, step-by-step order. However, the Twelve seem to understand the need to simultaneously reach each city and region. They did not want to give up Jerusalem to reach Samaria. Jerusalem became the front line of persecution against the Church and the Apostles perceived that they had been called by the Commander to operate inside the gates of Hell. With uncommon courage and supernatural power, the Church prevailed against Satan, Saul, and the Sanhedrin. In the summer of 1998 forest fires ravaged Florida. How well I remember the acrid smoke which filled my home in the northern part of the state from fires which burned in central Florida over one hundred fifty miles away. Surprisingly, the fire “jumped” from one location to another because strong winds carried live embers great distances. Once I drove down Interstate 4 from Daytona to Orlando and witnessed the fire from a pine forest on the western side of the road leap about three hundred yards and set ablaze the eastern shoulder. Hundreds of thousands of acres were consumed by the great fires of 1998. In Acts 8, the Holy Spirit blew on a small fire in the Jerusalem Church. With the hot breath of Saul’s Satanic persecution, live embers were scattered to the ends of the earth. Had the wind of persecution not blown, would the Church have left Jerusalem? God knows. How many missionaries have set Gospel sails by opposing gales? More than we would believe. What do we believe? Often is the case that a Christian must not only know the doctrinal peculiarities of his own church but also how those doctrines differ from those of other churches. As it pertains to The Lord’s Supper, there are four distinctive theological views: Catholic, Lutheran, Zwinglian, and Reformed. Catholics believe in Transubstantiation. In this view, when the bread and wine are blessed, they transform and literally become the body and blood of Jesus Christ. Lutherans believe in Consubstantiation. They teach that the elements in the supper do not change, but that Christ is physically present “with (con-), in, and around” the bread and wine. Zwinglians believe in Memorialism. Many denominations teach that the elements in The Supper are symbols which only recall the person and work of Christ. Calvinists (Presbyterians, Reformed) believe in Suprasubstantiation. While the bread and wine are unchanged and symbolic, the receiver of the elements is lifted by the Holy Spirit into the presence of Christ in heaven and feeds on Him by faith. While three of these positions are referred to by their patriarchal proponent, all four could just as easily be associated with the city out of which they arose. Those respective cities are Rome, Wittenberg, Zurich, and Strasbourg. When one thinks of Calvin’s ministry, the first city that comes to mind is Geneva. However, the first written expression of what has come to be known as the “Calvinist” or “Reformed” view of the Lord’s Supper was made by theologians from Strasbourg, France. The Tetrapolitan Confession was an attempt by Martin Bucer and others to create concord between Lutherans and Zwinglians through “a middle way”. They represented four cities (hence the name of the confession) in southern Germany which had become bastions of Reformation: Constance, Memmingen, Lindau, and Strasbourg (modern day France). Written and presented to Emperor Charles V in 1530, the confession was the earliest attempt of “The Reformed Church” to answer the question “What do we believe?” For nearly a decade, individual leaders had defined many important doctrines and created consensus around their teachings. However, as one can clearly witness from church history, Luther, Calvin, and Zwingli could not come to an agreement on the doctrine of the Lord’s Supper and five centuries later, neither have their children. 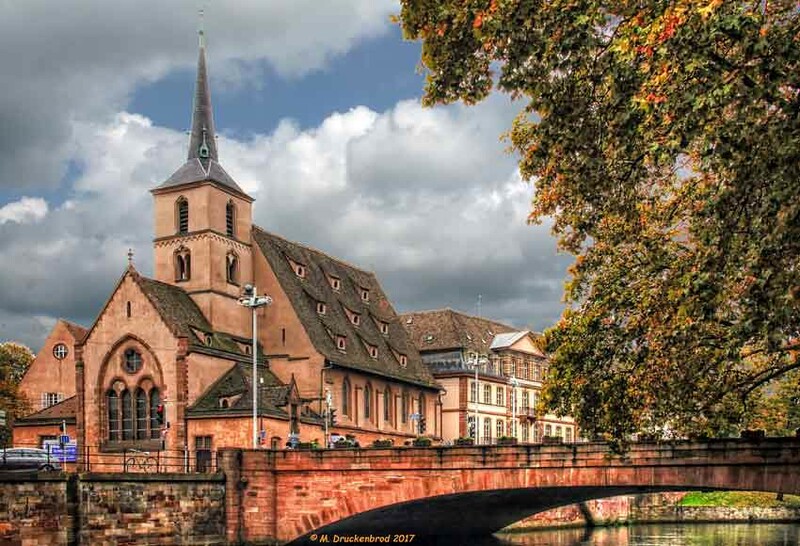 In a few days, a group from the church of which I am the pastor will travel a mere two hours south to visit Strasbourg. While there, we will take a “Reformation Tour” and spend some time in Europe’s oldest Christmas market. It would be naïve to believe that the theology and faith of the Reformers are imprinted on the city of Strasbourg any more than Jesus’ faith was imputed to Jerusalem. By calling and vocation it is, perhaps, incumbent upon me to encourage those who visit Strasbourg (or even dream about doing so) to do more than recall the Reformation. Instead, let us all “remember” Jesus!